Older adults’ hearing loss frequently is attributed to the aging process, but some medications also can cause damage that can lead to hearing loss. Because of the increased incidence of medication use among older adults, physicians should be aware of medications that may be considered ototoxic. Medications and environmental substances that damage structures within the inner ear or vestibule-cochlear nerve are considered ototoxic, with at least 300 medications identified as such.1 The damage they cause to hair cells prevents the transmission of sound and motion into electrical impulses the brain can understand. In addition to being aware of symptoms associated with ototoxicity, clinicians should consider utilizing audiologists, who can perform hearing tests before, during, and after the administration of medications to detect the progression of ototoxic hearing loss. Before starting patients on a medication known to be ototoxic, it is important for the health care team to consider the possible effects hearing and/or balance problems may have on a patient’s quality of life after drug therapy. In cases where alternatives are possible, it is best to avoid ototoxic medications, especially in the elderly and patients with preexisting hearing loss or additional risk factors for increased ototoxicity. Aminoglycoside antibiotics, including streptomycin, amikacin, kanamycin, gentamicin, and neomycin are just a few of the aminoglycoside antibiotics known to cause permanent hearing damage and should be reserved for serious life-threatening diseases where saving a patient’s life outweighs the possibility of damage to hearing. Patients with eardrum perforation should not be prescribed topical ototoxic agents such as neomycin otic drops because these medications could be absorbed in the inner ear, resulting in damage and hearing loss. Medications such as cisplatin, bleomycin, carboplatin, and cyclophosphamide are used to treat cancer but can cause permanent hearing damage. Ototoxic effects can be minimized, though not always prevented, by close blood level monitoring. In these cases, hearing loss often presents as a sensation of hearing muffled voices, though vestibular effects also are common. Hearing loss usually occurs after one to two weeks of treatment, although it often can be delayed up to six months posttreatment. Most NSAIDs can potentially cause temporary tinnitus and hearing loss, but the toxic effects typically can be reversed once the medication is discontinued. It is important to keep in mind that NSAIDs also can cause kidney injury and reduce renal function, which may increase the risk of ototoxicity when given with other ototoxic medications. Salicylates, including aspirin and aspirin-containing products, are known to cause tinnitus and hearing loss, with the effects being dose dependent (ie, 2,700 mg or more per day). Topical salicylates containing methyl salicylate also can cause tinnitus. As with NSAIDS, the effects generally can be reversed once the medication is discontinued. Common loop diuretics, including bumetadine, chlorthalidone, ethacrynic acid, and furosemide, usually are ototoxic when given intravenously for acute kidney failure, acute hypertensive crisis, or acute pulmonary edema/congestive heart failure. Rare cases of ototoxicity have been found when patients with chronic kidney disease take these medications orally in high doses. Other categories of medications known to be ototoxic include quinine, erythromycin antibiotics, anesthetics, cardiac medications, glucocorticosteroids, and mood-altering drugs. Because of the uncertainty about medications that may cause ototoxicity, it is important to advise patients to report any issues such as the emergence or worsening of tinnitus when new medications are started or doses are increased. The sidebar below provides a summary of reminders that can help to minimize the risk of ototoxicity. • Familiarize yourself with ototoxic medications and their associated risks. • Recognizing ototoxicity early on can lead to earlier identification and possibly prevent permanent damage. • Do not treat the elderly and others with preexisting hearing loss with ototoxic drugs if other effective alternatives are available. • Recognize that combination therapy of ototoxic medications increases the risk of hearing loss. • Discuss with patients the potential for ototoxicity of any drugs. • Use the lowest effective dose possible, and closely monitor blood levels of known ototoxic medications. • Remind patients to minimize their exposure to loud noises when taking ototoxic medications and to immediately report any hearing changes when new medications are added or doses change as part of their treatment regimen. • Inform patients that over-the-counter medications such as aspirin and NSAIDs can be ototoxic. • Encourage patients to report any changes in hearing immediately, especially when new medications are added or doses increased. • When possible, assess patients’ hearing before starting ototoxic medications and monitor during treatment as symptoms alone are not always reliable. 1. Bauman N. Drugs and tinnitus: put yourself in the driver’s seat. Tinnitus Today. 2009:34(1):21-23. 2. Cianfrone G, Pentangelo D, Cianfrone F, et al. Pharmacological drugs inducing ototoxicity, vestibular symptoms and tinnitus: a reasoned and updated guide. Eur Rev Med Pharmacol. 2011;15(6):601-636. 3. Ototoxicity. Vestibular Disorders Association website. http://www.vestibular.org/ototoxicity. Accessed March 23, 2014. 4. Ototoxicity. Virtual Medical Centre website. http://www.myvmc.com/diseases/ototoxicity. Last updated March 13, 2014. Accessed March 21, 2014. 5. 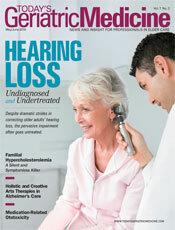 American Speech-Language-Hearing Association Audiology Information Series. Medication effects on hearing. http://www.asha.org/uploadedFiles/aud/InfoSeriesHearingMedicationEffects.pdf. Accessed March 21, 2014. 2012_Jul_12.pdf. Published 2000. Accessed March 21, 2014. 7. American Academy of Audiology. American Academy of Audiology position statement and clinical practice guidelines: ototoxicity monitoring. http://www.audiology.org/resources/documentlibrary/documents/otomonpositionguideline.pdf. Published October 2009. Accessed March 21, 2014.